I thought I'd spend the evening listening to Hurricane Irene leave town and writing a blog post. One of the coolest things I realized when I was walking around the Hall of Fame was that I was seeing first hand some pieces of memorabilia that shaped the very foundation of the history of the game that I love so much. There's probably not another player who completely embodies that history than George Herman "Babe" Ruth. You all know that I am NOT a Yankee fan. I don't pretend to even tolerate them. I downright loathe them. However, I respect them. No franchise in baseball carries as much history as the Yankees. One of the biggest reasons is Babe Ruth. He was IT. A true showman. Whether you believe all of the legends. Did he really call his shot in the 1932 World Series? I don't doubt it, but there are stories that try to bring the legend of Ruth back to Earth somewhat. I love Ruth because of the larger than life aura that still surrounds him, even today. He might not have been the single greatest player ever (some believe that Ty Cobb should have that honor), but he should be player #1A. Ruth saved baseball from the black eye that was the 1919 Black Sox scandal. Ruth's epic home runs captivated crowds and put butts in the seats. They didn't call old Yankee Stadium "The House That Ruth Built" for nothing. So, my point is (because I'm rambling) that whenever I saw a piece of Ruth's memorabilia in the Hall, my heart skipped a beat. I had to make sure that I, like many other fans before me, touched the bust of Ruth when I saw his plaque. I couldn't even speak when I stood and admired his plaque. In my opinion, the entire thing should be gold or something. Maybe some flashing lights. It is amazing to see in person. It was really cool to see this book. According to the display case, Ruth signed this book for his nurse the night he passed away. It was one of his final acts and it is very fitting, signing an autograph on his deathbed. By far, the coolest piece of memorabilia that I was able to get close to was Ruth's jersey. Seeing that big #3 and those pinstripes can take the breath away from even the staunchest Yankee hater. It was almost surreal to walk along the row of artifacts and items and come upon this jersey. Truly an amazing experience that all baseball fans should feel at least once in their lives. My 45th Hall of Famer signed baseball was also my 28th TTM success - Andre Dawson. I mailed to Dawson on August 16 and got the ball back on August 25, making him a 9-day TAT. He charges a fee of $45 for a baseball, but looking at his signature, it is well worth it. He asks that people include an extra $10.00 for an inscription, but for me, I think the ball looks perfect as is. Dawson was the 1977 NL Rookie of the Year and the 1987 NL MVP. He is a rare instance of a player winning the MVP on a last place club. Hitting 49 home runs that year definitely helped his cause.He was elected to the Hall of Fame in 2010 with 77.9% of the vote (his 9th ballot). As today wore on and news continued to become available on the tragic passing of Mike Flanagan, I realized the importance of a few things. According to multiple sources, and confirmed by the Baltimore Sun, Mike Flanagan took his own life yesterday at the age of 59. I sincerely doubt that anyone will ever know the full reason or reasons behind his decision to do such a thing. Baltimore's sports talk radio station had reported that Flanagan was despondent in recent weeks/months due to the poor play of the Orioles and the public perception that (as Executive Vice President from 2002 to 2008) it was his fault. I have not seen any other reports which confirm this theory, however, ESPN's Tim Kirkjian, who was close to Flanagan, stated in this article that Flanagan's demeanor has not been what it once was before he was dismissed in 2008. I don't doubt that he was disappointed that he couldn't help return the franchise to its past glory, but it seems to me (and I'm no doctor) that he was battling depression and the perception of the job that he did as GM was only the tip of the iceberg. Further reports on the Baltimore Sun's webpage say that Flanagan was dealing with financial issues and they are citing those issues as the reason behind his passing. Before I learned about the financial aspect of the situation, I thought long and hard about the first scenario. Yeah, on the surface, it sounded kind of ridiculous that someone would take their own life because of the poor play of a baseball team, but when it is your job to make that team a winner and you put your heart and soul into that job, I think I can understand maybe a little bit why someone would feel that way. Something else I thought about, too, was that I notice many times when I read blogs and forums based on things such as sports, etc, it is really easy for people to sit behind keyboards behind anonymous online handles and avatars and criticize the people who do these things for a living. Trust me, I'm guilty, too. Last week I was screaming at my computer, praying for the Orioles to release Kevin Gregg because he was terrible and seemingly cost the Orioles a chance at a much needed win. One tends to forget the human element behind these things. These players, coaches, managers, executives all are human beings. They have feelings, families, friends who all love and care about them. When you go on these forums and read the things some online 'trolls' post day after day, week after week about some of these people, I can see how it could get under someone's skin. One of my favorite places to catch Orioles news is Roch Kubatko's blog over at MASNSports.com. I've actually met Roch in person and he is an amazing guy. Really cool and down to earth. I don't know how he deals with some of the just mean and nasty people who post on there, seemingly only to get their names in print on the internet. I'm glad I wasn't one of those people who cowered in their mother's basement and hid anonymously behind some screen name and blasted every member of the Orioles' front office. I have been critical of them, and as a passionate Orioles fan, my emotions have gotten the better of me at times and I have called for people to get fired. Not once, though, did I ever call for Flanny to get fired. I did believe that he lacked the experience to have been named GM (or Co-GM, as it was when he was there), but I felt that he did the best he could in a hard situation. Sometimes the best you can do is all you can do. Another point, coming from someone who has known people who have both committed suicide and others who have attempted it, is that we all need to try to do our part to help others. Depression is a nasty thing. A lot of people suffer from it and they don't even know it. If you see someone who you think needs your help, please help them. If it is a compliment, a pat on the back, a kind word, etc, try to do your part to make someone's day better. Sometimes that's all it takes. Tell your friends and family that you love them and do it often. It isn't 'weird' to do this. Let someone know that you care about them. If you know someone who has been going through a tough time; maybe the economy forced them out of a job, maybe their grandmother died, maybe they had a stroke of bad luck; do what you can to try to make them feel better. That's the best you can do. You can't save everyone, but sometimes the best you can do is all you can do. Finally, if someone tells you that they are considering suicide, please get them help. Thanks everyone for reading and giving me a place to vent about a terrible situation revolving around a player who is a legend for the team that I have loved for a long time. I wrote it based solely on emotion, so if it doesn't read clearly or make a whole lot of sense, I apologize, but I wanted to write something unrehearsed and from the heart. 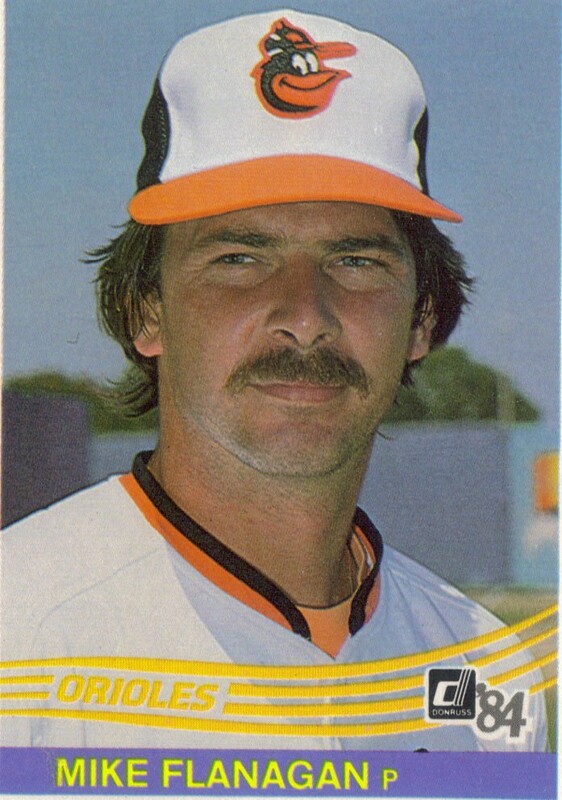 According to various reports, former Orioles pitcher, broadcaster and executive, Mike Flanagan was found dead on his property in Maryland. Flanny was the 1979 AL Cy Young award winner when he went 23-9 for the Birds. I was completely shocked when a friend of mine told me, just a few minutes ago. Flanny has been doing commentary on O's games for MASN. This is a huge loss to the Orioles, for sure. I was lucky enough to get another TTM success today when I got this response from the 1949 AL Rookie of the Year, Roy Sievers. Sievers is my 27th TTM success. He signs for free. I mailed to him on August 10 and got the ball back today (August 24) making it a 14-day TAT. Not too bad. I love that he included the ROY 1949 inscription. Sievers played from 1949 to 1965 for the Browns, Senators, White Sox and Phillies. He was a teammate of Virgil Trucks in 1953. Pretty cool! Sievers led the AL in home runs with 42 in 1957 and finished third in the MVP voting that year. When he retired, he had 1,703 hits, 318 home runs, 1,147 RBI and a lifetime average of .267. A pretty solid career, that's for sure. I'm really glad I got this ball back. Being that Sievers was a St. Louis Brown, that is pretty cool, since they went on to become the Orioles in 1954. Too bad he didn't get to play in Baltimore. I sent a TTM request off to the Commissioner of Baseball Bud Selig on August 16 and got the signed ball back today (August 23). That's a 7-day TAT. AWESOMELY FAST!!! There's one catch, though. This wasn't the ball I sent to Mr. Selig to be signed. He kindly replaced my cheap x-out Rawlings Official League Ball with this beautiful Official MLB ball. Oh man, that was so cool. I would use the Official MLB baseballs if they weren't so darn expensive. I wanted to buy a bucket of them, but the cheapest I saw was a bucket for $100. I've thought about getting some vintage Official MLB baseballs, but they usually go for $30 or higher. So, needless to say, I was really happy when I got this ball in today. I knew right away when I opened my mailer that the ball was from Selig because I had read that he replaces baseballs sent to him with the Official ones, which, to me, is really cool! Selig signs for free and is very fast at returning, so I highly recommend that you try him. I also am pretty certain that Selig will be a member of the Hall of Fame one day, so this is pretty much a 'guaranteed' Hall of Famer. Let's hope so at least. I intend to get autos of some of the other past commissioners. Happy Chandler is relatively affordable, his autos on baseballs go between $100-$125. The first being the T-206 'Gretzky' Honus Wagner. WOW. I hit my knees when I saw this card. My heart literally skipped a beat. Normally, I could imagine someone laughing at me when seeing how I reacted to a simple piece of cardboard. Yet, this is certainly not just a piece of cardboard. This card is the reason people collect cards in the first place. The Holy Grail, if you will. $2.9 million at its last auction. Unbelievable. I was ON MY KNEES! It was so amazing to be able to see this card in person. To be mere feet from it. This was such a great feeling. Another card that I was breath taken by was this beauty. A Gem Mint 10 1952 Topps Mickey Mantle. Holy WOW. Gem Mint 10. Is that even possible? This card is the reason why Topps is around. My dad distinctly remembers putting this card in his bicycle spokes as a kid. Countless grandmothers have thrown them away. Topps, themselves, dumped a load of them in the Hudson River. Let's dump it in the river!!! Wise idea, guys. Of course, had they not done that, the card would be everywhere. This was an amazing part of the Hall of Fame. There was so much more, too, but these cards were so amazing! I hope you all enjoy looking at them, too. I got another TTM success today in 'Bullet' Bob Turley. Turley is my 25th TTM success. I mailed to him on August 10 and got him back today (August 20). That makes him a 10-day TAT. Not too bad! He signs TTM for free, by the way... I wrote about Turley here when I was profiling my 1955 Topps set. He was the Cy Young Award and World Series MVP winner in 1958 for the Yankees. I'm really happy I got this ball signed. Turley didn't play very long (12 seasons) but he did have a pretty nice career. Needless to say, I was happy to see that inside my mailer was my 44th Hall of Famer, Mr. Billy Williams! Williams (my 24th TTM success) played from 1959 to 1976 for the Cubs and A's. He only played a handful of games in 1959 and 1960, then earned the 1961 Rookie of the Year award. He retired with 2,711 hits, 426 home runs and a batting average of .290. He won the batting title in 1972 and was elected to the Hall of Fame in 1987 (his 6th ballot) with 85.7% of the vote. I need to check and see, but I think I have three other Hall of Famers who I'm waiting on. I may try to get a few more (of the 8 pending baseballs) in before I send off more requests. We'll see. Something really cool I saw when I was in Cooperstown was the case that housed all of the World Series rings. Rings weren't issued to the World Series winner regularly until 1926. Before that, players were given trinkets like gold pocket watches, medallions and charms as the token of remembrance of their championship season. You can see the huge case above where the rings are found. Also, in the foreground, you can see some of the trinkets that were issued prior to the customary World Series Ring. Above is the 1966 World Series ring, which the Orioles won by defeating the Dodgers. Here is the 1970 ring that the Orioles won as they triumphed over the Reds. This was the World Series that Brooks Robinson shined in, winning the World Series MVP award. Here is the ring from the 1983 World Series. The O's defeated the Phillies that year, Cal Ripken caught the final out and Rick Dempsey won the World Series MVP award. I thought this was a really cool part of the Hall. I'd love to get my hands on one of those rings, but I'm sure they are expensive. I think it would be a travesty for someone to sell theirs, but we have all seen former players hawing their precious trinkets and trophies to pay for bad investment deals, gambling debts, alimony, lawyer fees, drugs, etc. That's definitely a shame. I picked this ball up off of Ebay the other day because I thought it was an antique baseball. Boy was I wrong. This thing is bigger than a softball. My question, I guess, is what kind of ball is this, then? I mean, I think it's awesome, but what sport did it come from? Anyone have any ideas? How old is it? I've seen baseballs of similar design that dated to the late 1800s - early 1900s. 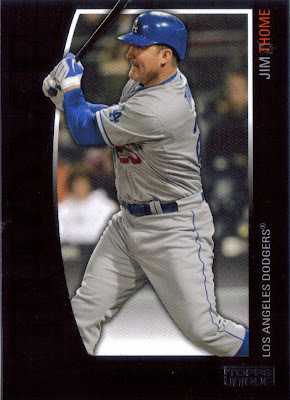 Jim Thome finally collected his 600th home run tonight. I'm really glad he reached that plateau. He became the eighth player in history to reach the 600 mark. I was almost able to get Thome's autograph last year in Baltimore, but he wasn't signing. I was able to talk to him, though. He's a real classy guy. I hope this erases any doubt that he will get into the Hall of Fame once he retires. Thome has always been a great player. For all of you who have not been afforded the opportunity to visit the National Baseball Hall of Fame and Museum in Cooperstown, NY or for those of you who haven't been in a long time, I have decided to share my experience with you via several blog posts showing some of the things I found interesting. Something I realized as I have been collecting autographs of Hall of Famers on baseballs is that I like finding the old style baseballs. Be it ones from the era of league presidents or beyond, I find them to be really cool. So, that being said, the Hall of Fame boasts a lot of baseballs from the game's beginnings and I found those exhibits to be very interesting. Here are some examples of early baseballs. The figure eight style ball originated around 1860 and was the basis of the style of ball that is used today. I just watched an Ebay auction end for a figure eight style baseball and it sold for $259.93. When I started watching the auction two days ago, the ball was going for $10.50. That's a HUGE jump. Clearly, these baseballs hold great value and I'm definitely hitting up some antique shops now. The precursor to the figure eight style ball was the 'lemon peel' baseball. It consisted of four pieces of leather stitched together and were used from around 1850 to around 1860. Seamless baseballs were used around the turn of the century in hopes that they would surpass the figure eight style with exposed stitching, but as we can see today, they didn't quite work out. Here is a picture of the oldest existing baseball from a scheduled baseball match (see the caption under the ball). The winning team would decorate the game ball and display it as a trophy showing off their accomplishment. Here are more examples of trophy balls. Both are from the mid 1800s and look really cool. Here is a photo of the ball from the first baseball game where admission was charged. Again, baseballs like this look really awesome. I wish I could stumble upon something amazing like this. Inside this case is a series of trophy balls from various teams. Most were 'working man' teams, kind of like adult softball leagues these days. This mass of trophy balls used to be displayed by the Eckford Base Ball Club in Brooklyn. They were a collection of laborers who would play in the New York City area. They amassed over 150 trophy balls during their existence. Here is a ball that was hit for a homer by Frank 'Home Run' Baker in August of 1911 (making this ball almost exactly 100 years old). So, as you can see, the Hall of Fame boasts a lot more than just player plaques. I wish I had weeks that I could have spent there, instead of just the few hours I was afforded. If anyone out there has a figure eight or lemon peel style baseball that they would like to donate to a worthy cause (my man cave), I'm all ears! A final piece I was able to get in Cooperstown is the above official MLB 2130-2131 logo baseball. I got this ball from the same shop that I got the previously mentioned Ferrell and Herman baseballs. I have recently decided that I would like to get some older (maybe antique) baseballs and display them in my man cave. I asked the guy in the shop if he had any old baseballs, he laughed and said "I have boxes of them..."
He brought out a box that had a bunch of baseballs in it and let me take a look. I found the Ripken ball and took out an older looking one that had some faded signatures on it. I asked him if he'd be willing to sell one of the baseballs that had a bunch of signatures on it, and he said he might after taking a better look at them. He pulls out a magnifying glass and looks at one of the balls. "Oh, that says Ed Ford on it... well that's Whitey Ford. Oh wait, that is Mickey Mantle on the sweet spot! Its faded but you can see, its him..."
Yep, it was Mantle, alright. Dang, I wasn't going to be able to get that ball. I picked up one that looked older, it was definitely an Official League Spalding Ball that also had some faded signatures on it. He looks at it and points out: Bob Feller, Early Wynn and Buck Leonard among the signatures. The ball also had 1976 induction written on it. Jeez. I helped this guy find at least two baseballs that were worth LOTS of money. He did give me a nice deal on the Ferrell and Herman baseballs and also threw in a signed post card that I will discuss in my next post. I thought you guys would love to hear about my almost epic pickups though... Almost. The second of the two signed baseballs I got in Cooperstown was a ball autographed by Rick Ferrell. I have been looking to get one of his baseballs for a while now. He is one of the cheapest HOF signatures, even though he passed away in 1995 at the age of 89. I wrote about him here when I picked up his 1933 Goudey RC. He was elected to the Hall of Fame in 1984 by the Veterans Committee and seems to be one of the biggest cases as to the flaws in their former way of enshrining players. Ferrell had a long career, but his numbers don't seem to measure up to those of other Hall of Fame players. Nonetheless, I'm glad I was able to pick up this baseball for $50 and have it become my 43rd Hall of Famer in my collection. I really enjoyed all of the memorabilia shops in Cooperstown. It was awesome seeing all of the autographed baseballs that were there. Some of the shops were very overpriced on their autos, but if you look hard enough, you can find a few where the autos are reasonable. I found one that was attached to a restaurant (sorry, I can't remember the name) that had a bunch of autos for great prices... I bought 2 autoed baseballs from the guy, plus a blank ball. The first ball I'll show is this Billy Herman signed ball. The guy originally wanted $100 for it, but since he thought it was too faded, he knocked the price all the way down to $30.00. I had to jump on it. Don't worry, the ball is JSA authenticated. I think the auto is fine. Herman (b. 1909 - d. 1992) played in the majors from 1931-1943, 1946-1947 for the Cubs, Dodgers, Braves and Pirates. He retired with 2,345 hits, 47 home runs and a .304 batting average. He also managed the Pirates in 1947 and the Red Sox from 1964 to 1966. His managerial record was 61-92. He was elected to the Hall in 1975 by the Veterans Committee. I was really glad to be able to pick up this baseball, especially since most of his baseballs average over $100. Herman is my 42nd Hall of Famer. First off, I got this pennant commemorating the 1993 All Star game that was held at Camden Yards in Baltimore. Not too bad. I didn't have but one pennant (and no clue where I stored it) so it was cool to get one to put on the wall. Hopefully someday I'll find the other O's pennant that I own. Finally, the clerk showed me this 1950's O's bumper sticker right as I was checking out. I thought it looked cool. So, I got two more things to hang up on the wall in the man cave. I think they are pretty cool. Don't worry, I have more stuff to show off, which I will get to in the next few posts. Finally, I found a shop that had a lot of random vintage stuff. They had a sweet Orioles bobble head from the 50s, but they wanted $245 for it... yeahhh, that wasn't going home with me. I can find one elsewhere cheaper, hopefully... I did, however, find a couple old glasses that I thought looked cool. I loved the above A's glass because of the colors and the elephant. Below, I chose the Senators glass because that is the team that my dad watched as a kid (even though he has gone on record saying he'd rather watch paint dry instead of a game...). During my awesome meeting with Drew the other day, he hooked me up with a poster that he found in one of the tubs his dad picked up for him (the same place his mystery binder came from). He ended up with something like 3 or 4 of these so he was nice enough to give me one. I plan on hanging it up in my 'man cave', for sure. Thanks Drew! It looks really cool and I appreciate it! He and I have been linking each other's blogs for a long time, it seems. It is funny to me that even though he is a huge supporter of the one baseball team that I absolutely hate (the Yankees), he and I have actually parlayed that friendly rivalry into another building block to our friendship. When Drew found out that on our way home from Cooperstown, we would be in the general vicinity of where he lived, he and I decided that it would be cool to meet up at a Hudson Valley Renegades game (so I could save some postage on the next stack of cards I had set aside for him and so we could finally meet in person). It was really cool to finally meet up in person and be able to see Drew's card collection in person and be able to actually add to it while I was there. I also met his dad and his sister who were equally awesome people as well. I also had my cousin Andreas from Germany along and he also had a blast. Dutchess Stadium was really nice. It was also packed because a double header was being played today. The team is in the same league (NY-Penn) as Auburn (who I saw on the 2nd) but the crowd and stadium were polar opposites! I realized a lifelong dream today when I made the pilgrimage to Cooperstown, New York in order to visit the National Baseball Hall of Fame and Museum. I took 293 pictures in Cooperstown and over the course of time, I'll try to share them all with you. Right now, though, I'm really tired from all of this driving and I have a big day planned tomorrow (where I can finally meet another blogger in person) and see another minor league game (weather permitting). The drive to Cooperstown from Rochester (where my younger brother had lined us up a hotel room) was beautiful. The weather on the drive down was just about perfect. The New York countryside was amazing! Downtown Cooperstown was as picturesque as I had imagined it. I was so excited when we walked along the street and realized that right in fromt of us was one of the most hallowed halls in all of sports. I'm going to skip right to when we entered the plaque room, even though this is the place we visited last in the building. I was so overcome with emotion when I entered the room, my mouth was wide open. I probably looked goofy, but I didn't realize, that's for sure. I made sure to remove my hat when entering, because, I don't know about you, but to me it was almost as sacred as a church. No sacrilege intended, but that's just how I feel about the place. I stood in the entrance, tears welling up in my eyes, as I wrestled with the decision - You can only enter the room for the first time once in your life... whose plaque do you go to first. I thought long and hard and came to the determination that as an Oriole fan (I was wearing my Nolan Reimold shirt, afterall) it had to be... Brooks. I made my way to his plaque, touched it and took this picture. I made sure to read it, of course. Then, as a baseball fan, next, I went to the 'First Class' wall and read each plaque for Ruth, Cobb, Mathewson, Johnson and Wagner. I made sure to touch the bust of Babe Ruth, as countless others had done. (Pictures of those plaques will be posted in a future entry). Finally, the kid in me went to the plaque that I had waited all of my 'fandom' to see in person. Cal Ripken, Jr. I seriously had to fight back tears when I walked up and saw the plaque of the player who I idolized growing up. I could have gone to the Hall many years ago, but always told myself that I wouldn't go until Cal was enshrined. I know that anyone who knows me knows how important it was for me to be able to see Cal's plaque. If you look closely, you might see a tear in my eye, but I did my best to wipe them away before this picture was shot. I can't put into words how awesome it was to be able to finally get to the Hall of Fame. I hope you guys enjoyed this brief look at what I accomplished today. I fully intend to post a lot more about the trip in future entries. I have plenty of pictures to be able to do it justice, that's for sure. Continuing on our road trip, we left Pittsburgh this morning and headed north/northeast along I-79, then along I-90. We made slight detours to Lake Erie and Niagara Falls, then made our way to a minor league game in Auburn, New York. I was able to knock off another minor league park and although the amenities are scarce at Falcon Park, the atmosphere was very down to earth and enjoyable. Falcon Park was originally built in 1927 and is called this because it was built by a fraternal organization in Auburn known as the Polish Falcons. The original stadium was demolished in 1995 and the new stadium was built in the same location. The Doubledays are the Single A affiliate of the Washington Nationals in the New York-Penn League. We got to the game 20 minutes late and were pleasantly surprised to find out that general admission seats were free tonight... Never had that happen before. We got to see Auburn blow out the Tigers 13-3. If you look, the Tigers committed 5 errors. Kind of hard to win a game if you are giving away that many free outs. The only name I recognized on either team was the Tigers' catcher, Patrick Leyland, son of Detroit Tigers' manager Jim Leyland. The weather was amazing. We sat back in our seats and just enjoyed the game. No scrambling for autographs. We enjoyed some pretty good hot dogs (they were almost like a knockwurst), some cool temperatures, a nice breeze and a hell of a sunset. I caught a foul ball (so, now I have baseballs from the Carolina League, Southern League and the New York-Penn League). I wasn't impressed with the amenities of the stadium, but really, that wasn't what we were looking for tonight. We wanted to unwind from a long day of driving and catch a baseball game, old school style. The field had a very "home town" feel to it and when the game was over, I was a little sad to leave. If anyone is in the Auburn area, you really should give their field a look.